We’re beginning Hour 31 of the “99 Psychs on the Wall” Marathon on the cable channel Cloo here at midnight Monday morning. 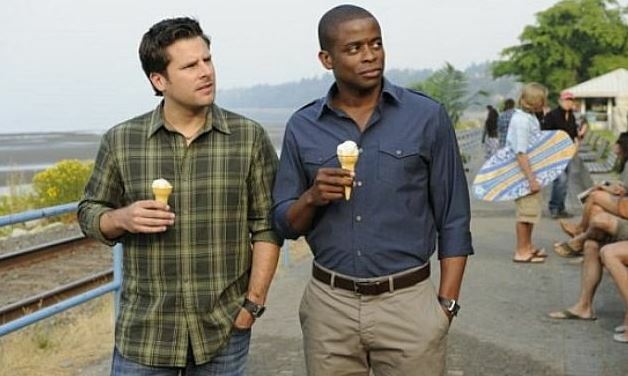 Have you seen all 99 Psych episodes? We have. Many times each for some, like the Halloween episode “Tuesday the 17th,” or when Henry goes undercover in “The Old and the Restless,” and Juliet dons roller skates in “Talk Derby to Me.” And we have found a pineapple (or something that looks pretty darned close) hidden or not-so-hidden in almost every episode. The funniest ever detective-crime-drama-comedy beat the odds to get renewed for yet another season with next year’s Season 8, and hits the rare benchmark of 100 hours on television. We’re eager to watch the 100th episode premiere Wednesday, March 27, 2013, on the USA Network. 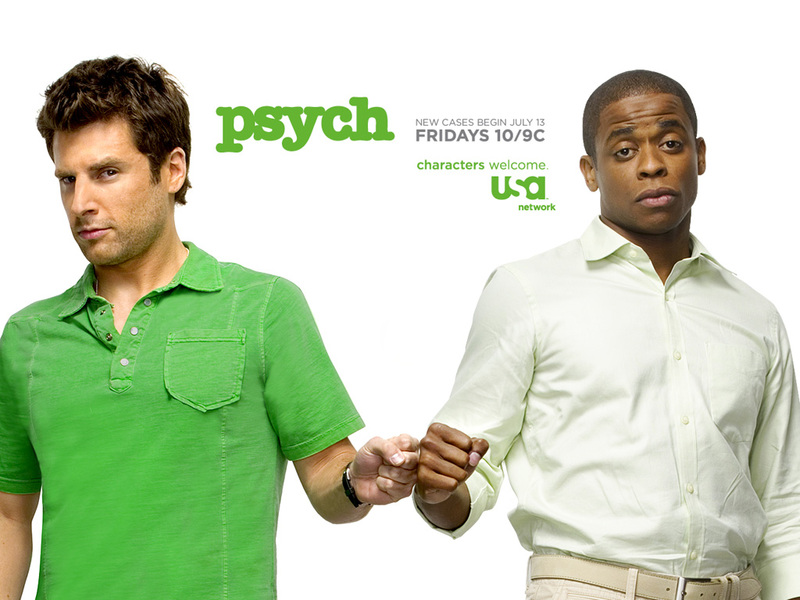 If you haven’t watched Psych before, tune in any time to the Cloo cable channel before Wednesday night and pick any episode. Psych stars James Roday as Shawn Spencer, a guy who was raised by cop father Henry (Corbin Bernsen) to pay incredibly close attention to details, and he uses this to fake psychic abilities with a detective agency of sorts called “Psych” with lifelong best friend Gus (Dulé Hill), who at any time may be randomly renamed on a case by Shawn as anything from Ghee Buttersnaps to Lavender Gooms to Lemongrass Gogulope. Shawn and Gus create a perfect buddy team-up and once you get on their wavelength you’re in for a lot of fun keeping up with pop culture references dropped sometimes wrong and sometimes right. Early episodes began with a flashback of Shawn and dad Henry, leading to some kind of parallel experience later in the episode. Young Shawn and Gus were as funny as old Shawn and Gus. Corbin Bernsen’s Henry is a great codger who knows about his son’s fake business and disapproves but never lets on to anyone else. Shawn and Gus are often hired on by a likable and trusting police chief, Karen Vick, played by Kirsten Nelson. The change-up compared to other detective shows is Chief Vick knows Shawn’s tactics are a little off kilter but he gets results time and again so she ignores his eccentricities and keeps bringing him back to help with Santa Barbara Police Department cases. The SBPD actually is filmed in Vancouver, BC, which can add its own humor as actors can be in a scene wearing shorts on a typical California afternoon yet you see their breath when they speak. The SBPD includes two other key characters, Shawn’s late season love interest Detective Juliet O’Hara (Maggie Lawson), and her partner, Detective Carlton (“Lassie”) Lassiter, played like Sergeant Joe Friday by Timothy Omundson. Lassiter never approves of Shawn’s methods, yet Juliet believes in Shawn’s “powers” no matter how strange–a bit like Lois Lane not recognizing Superman is Clark Kent. Other great recurring characters are Officer McNabb (Sage Brocklebank), the hilarious coroner Woody (Kurt Fuller), Shawn’s sweet and equally quirky high school crush Abigail (Rachael Leigh Cook), Shawn’s mom Madeleine (Cybill Shepherd), the really, really strange Mary Lightly (Jimmi Simpson), the psychotic Mr. Yang (Ally Sheedy), Juliet’s love interest Declan Rand (Nestor Carbonell), and Lassiter’s criminal girlfriend Marlowe (Kristy Swanson). Countless episodes should be included in the annals of classic television, and many bring in some of the best big actor guest stars as well as many blasts from the past. If you miss the Cloo “99 Psychs on the Wall” marathon this week, nearly all the episodes but only the latest from this season can be found on streaming Netflix.